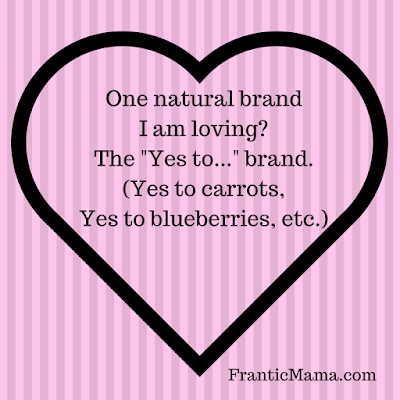 Frantic Mama: Is Au Natural always the best option? So-called natural and organic cosmetics and body products are everywhere these days. For a long time, I shrugged those labels off as a trend. After all, if the products are FDA-approved and available on any drugstore shelf, they must be safe, right? (Not so much, as it turns out. More on that later). My other argument is/was usually along these lines: who says "natural" is always better? Example: Poison ivy is indeed natural, but it certainly won't improve your skin tone. Is a man-made ingredient always so terrible? I didn't think so (and I still don't). Science is a great thing. Researchers have found and created some very beneficial products. BUT (yeah, you knew there was a big ol' BUT) I did just a wee bit of digging one afternoon and... yikes. In the U.S., we have wayyyy fewer regulations regarding what goes into our cosmetics and body products than they do in Europe. Likely, there are a thousand or so ingredients I could choose to avoid, but that's overwhelming. I'm taking baby steps to a (hopefully) healthier me. 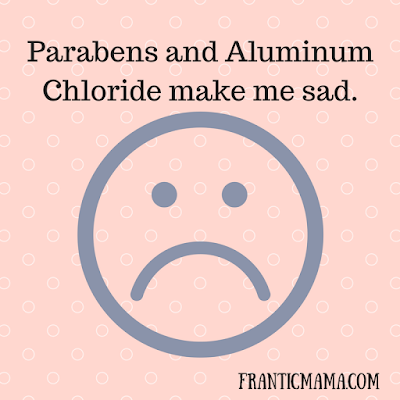 For now, my two main concerns are Parabens and Aluminum. Surely, I thought, the lotions I have been using for YEARS are good for me. Surely they are, right?! Well, I was quite crestfallen when I read the long list of ingredients... with not just one type-- but many types-- of Paraben, as well as the "wrong" kind of sunscreen (and all these years I felt so good about wearing sunscreen!). I don't know why it also took me FOREVER to try out a more natural, less chemical-laden antiperspirant/deodorant. (Okay, I kind of know-- I am a sweat-er. Yes, it's true). I figured none of those would work. But enough studies have found the exact same ingredients from my trusty old Secret in breast cancer tumors that I feel obligated to switch. The first one I'm trying is Schmidt's; it's available at Target for under $5 (price is something to think about. Most of the less-toxic lotions and potions cost more). I also ordered an expensive one from Arbonne for comparison purposes. I'll keep you posted on that. But if you want to know the current winner, click to this post. So now that I've opened Pandora's box, I'm curious about all of you! Do you try to be natural with your lotions and cosmetics, or do you trust that what's on the shelves is safe? 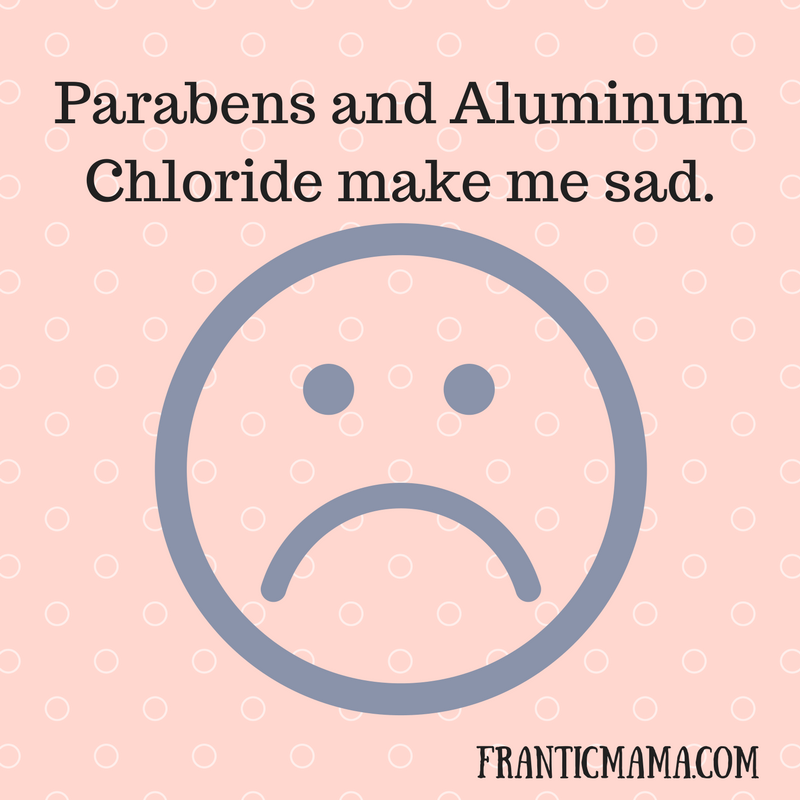 What chemicals do you avoid (or embrace)? Am I crazy and paranoid or finally on the right track? What are your most trusted brands? P.S. Salespeople: I respect your profession, but please don't use this blog post as an opportunity to pitch your products. Feel free to say what you love about your brand, but don't try to push them on my readers or me. Oh my goodness!!! I just ordered the more expensive detangler for my daughters hair because it is more natural. I am trying to find a good shampoo and stuff for their hair and body for both of my kids. I am willing to spend the $ on them but I need to start thinking of me too! Funny! We are on the same wavelength! I think people are becoming more and more aware of how many unregulated chemicals are in our products. I used to think "natural" was all hype, but am slowly converting... I need to switch out the kids' detangler too. What brand did you find?